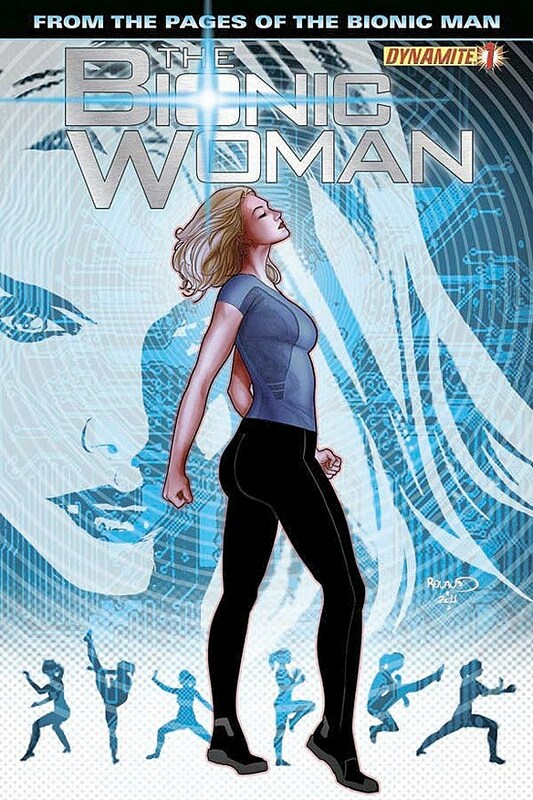 With a track record of female-centric books like Spider-Girl, Banana Sunday and even Models Inc. -- probably the single most underrated mystery ever published by Marvel Comics -- Paul Tobin seems like the perfect fit for Dynamite's upcoming Bionic Woman comic. In fact, it's Tobin that has me looking forward to the series, even though I have almost no prior knowledge of the franchise. In order to pass that excitement on to you, we talked with Tobin about his plans for Jaime Sommers, and how he goes about writing women as fully realized characters in a world of super-hero comics that often struggle with pulling that off. ComicsAlliance: I noticed when you made the announcement on your website, that you were writing The Bionic Woman, you pretty much went straight to talking about the toys. Paul Tobin: I love the toys. Love them. I actually had one of those "beauty hair" Bionic Woman busts where you could try out different hairdos on Jaime. I wasn't doing her hair or anything. I just like the toy. And part of the reason I talked about the toys is because EVERYBODY likes them, and also because we couldn't show much in the way of art, yet, so I wanted SOME visuals to work with.CA: The reason I bring it up is that right before you and I started talking about the series, I saw an old ad for a playset called "The Bionic Beauty Salon" that's just one of those truly bizarre pieces of this franchise. You have this woman with crazy robotic limbs that fights crime as a secret agent, and now you can Brush and Comb Her Beautiful Hair! PT: Yeah. 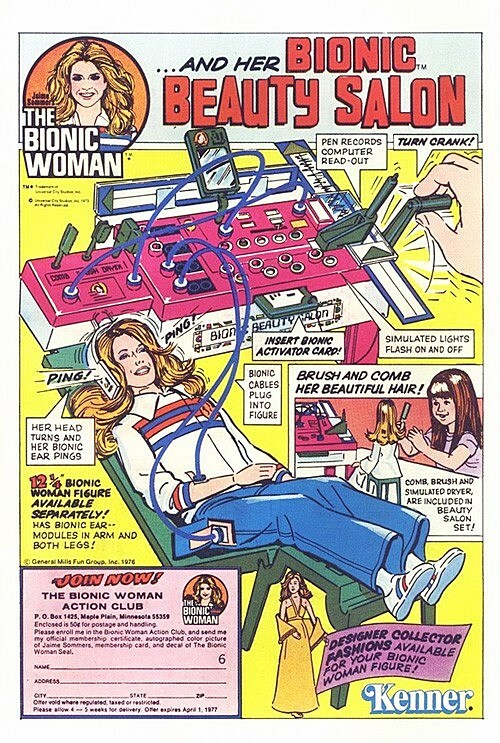 It's funny how many of the Bionic Woman toys had to do with beauty and such. It's not like there was a Bionic Man Suave Shaving Kit. Having said that, I want the hell out of one. CA: So are you planning to use it in your run? PT: The shaving kit, or the toys? So far, shaving has been a minor part of the Bionic Woman series. She does like to look nice, though, and there's a female secondary character. So... as usual, I'm picking and choosing all their fashions. I'm totally into that kind of thing. I love playing dress up with my characters. I want to avoid artists falling into the same fashions, the same outfits, etc. CA: Is that something that comes up a lot for you as a writer, going as far as describing what your characters are wearing? PT: Absolutely. I drop images into the scripts. I have a folder of fashions that I like, and I pick and choose which ones are the best for the moments. I tend to like 60's and 70's fashions. Weirdly, I even think they look more modern in some ways. And I try to keep in mind that characters can't just look nice, they have to move freely, so I can't put Jaime in a short tight skirt, for instance, because then she wouldn't be able to run or kick very well, and also there'd be a bit too much fan service. CA: Is it a matter of not wanting to have what you're doing derailed by art that takes things in a different direction? You talk about fan service, and I know that can sometimes change the tone of a scene. PT: The fan service is a big part of it. Some artists are just trained to show off cleavage and such... but that's actually a character trait. Not all women want cleavage showing, especially during a fight. And it's partly because this business happens so quickly that most people develop shortcuts, and one artistic shortcut is a set wardrobe. If you ask some artists to draw ten thousand women there will only be three or four different faces, and one or two body types and there will only be five different outfits. And those outfits are often not proper for certain characters. So, it's a bit of both. I'm guiding the feel of the characters towards where I want them to be, and I'm saving the artist time as well. CA: Have you always done that in your scripts, or was there a particular instance where you felt like you might run into a problem? I mean, not that I don't love Matteo Lolli's art on Marvel Adventures Spider-Man, but just to use that as an example, you are a guy who wrote a book with a kid-friendly version of Emma Frost. 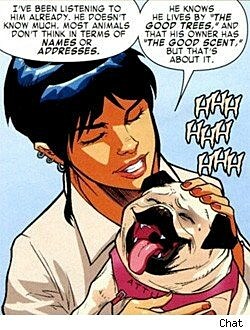 PT: Emma is one of my all-time favorite characters. She's going to be appearing on my website in my top 25 female characters countdown. As far as any specific instances, it's always been on my mind. Partially it was because tons of artists tend to draw clothes in the exact style of when they first learned to draw. So an artist might be drawing clothes from 1995 even if she's drawing a book in today's world simply because that's what she learned to draw. And a real turning point for me was my Models Inc series. I simply had to know fashion for that title. I couldn't put out a book about models and have them wearing crap clothes. Incidentally, Millie the Model is still upcoming in my "top 25" as well. CA: That was a great book, and it's another one that was focused on women as the lead characters, which is something that's been a pretty strong recurring theme in your career. 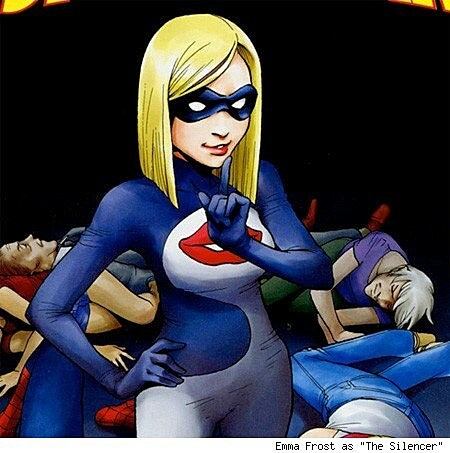 Banana Sunday, Gingerbread Girl, Spider-Girl, even Marvel Adventures Spider-Man saw you expand the cast to include Emma Frost, Blonde Phantom and Chat in supporting roles. PT: It's somewhat by choice, because there needs to be stronger female characters in mainstream comics. I enjoy writing female characters. I wouldn't necessarily say I enjoy it more than writing male characters (my upcoming "Prepare To Die" novel has a decidedly male voice) but it's just one of those areas where I seem to work well, and gravitate towards. I often get the "oh sh**, we need someone who can write a female character" calls. In Spider-Man I thought it was important to have a group of friends. Chat, of course, as a love interest, because I like to have some romance, and then Emma, because she's such a wonderful source of tension. And then Blonde Phantom and Captain Stacy were both there because they are interesting characters, and also shortcuts to action, because either one of them can put Spidey on a job in two panels, avoiding that horrible, "I just HAPPENED to run across YET ANOTHER crime" plot that occurs so often in comics. CA: So in an industry that often goes wrong with female characters, how do you go about trying to do it right? PT: Oddly... by not being so adamant about writing them as female characters. Women and men are quite similar, really. We both have hopes, dreams, fears, etc. Girls are prettier and look better on bicycles and such, but it doesn't mean that a woman does everything in a womanly manner. Here's my litmus test when I'm writing, and I'm sorry it's a little vulgar. I call it the pee test. Women and men both go to the bathroom and pee. That's established. I can write that in a script. But the second that I write, "She went to take a pee, which she did by sitting down, because she is a woman and her genitalia are different" then I've let the the fact that she's a woman intrude overmuch. Readers understand things. I don't need to constantly shout out a gender, or an age group, or a nationality. Establish that sh*t and move on. Doing it in any other way is condescending. CA: I imagine it doesn't hurt that you work in an environment like Periscope Studio, around a lot of women around that are creators. Do you ever get to a place where you feel like you need a second opinion about it, or does it all just come down to that one rule? PT: A little of both. I think I sometimes want that 2nd opinion, but I can usually visualize that 2nd opinion without even asking the question. If I'm thinking of taking a sentence over to Colleen Coover, or Erika Moen, or any of the other women in the studio, and I'm thinking, "I need to find out if this is offensive," well... I probably already know the answer at that point. That said... sometimes you push boundaries. Sometimes things should be offensive, in a certain way. No writer ever wants to look back on their career and think, "Wow. I sure did make my [readers] comfortable at all times, without every challenging them in the slightest." So... there's good offensive, and bad offensive. The fun is straddling that line, and the horror is knowing you'll fall off from time to time. CA: Can you give me an example of one of those times? PT: I can't think of a specific example right off, but one thing where I always pause is when I'm having a woman act like a total b***h. There's always a moment where I have to readjust and remind myself that I don't have any problem with having a man act like a total a**hole. Sometimes, men are a**holes. Sometimes, women are much the same. The pedestal has to be kicked now and then, or a writer isn't writing real characters. And I'm not so much talking about women as super-villains or anything like that. I'm talking petty things. It's small moments that make character to me. If Lady Nitro is trying to take over the world, you might think, "Oh. She's evil." But if you see her manipulating a nice couple to break up, you think, "Wow... she is not a nice person at all." It works on the emotions in a different way, and it's sometimes harder for me to pull the trigger on that second type. CA: On a personal level, or because it's sometimes the default setting for super-hero storytelling? PT: Either way. I rather adore women, so while it's easy for me to write both male and female characters as total bastards, I have this desire to fold in "chance of redemption!" into the female character. I believe, deep down, that all women are good at heart. Possibly I lack the proper high school trauma, or something. And... I always try to avoid those "default settings" as well, because I am so bored of heroes swinging / flying across town, and seeing a woman getting mugged, and popping down and punching the bad guys and then speeding off. It's there just for an action fix, and makes the woman just this weak plot point. And it's frankly not all that heroic. I always picture a friend calling me up and saying, "Hey. Can you come get me? Like... RIGHT AWAY? Because I was being mugged and then the Twirling Macho-Cat showed up and knocked them out, and I'm standing here in complete shock with five partially unconscious pissed off muggers, and it's not cool." CA: I think the question I want to ask now is whether the Twirling Macho-Cat is going to show up in Bionic Woman. PT: It's a fifteen part epic. Going to rock comicdom's very foundations! CA: It's interesting that you bring up the desire to have that chance of redemption for female characters, because -- and I say this as a guy who loves Catwoman and the Black Cat -- I often find that so frustrating. I was just talking about GI Joe: The Rise of Cobra, and how disappointed I was in the way they structured that movie so that the Baroness would ultimately be redeemed rather than just being the pure evil character that I love. PT: Exactly! Some people... they just EVIL. And while the road to redemption is fascinating (when somewhat rarely done properly) it ruins the character to a large degree. It changes the Baroness from the Baroness into Mistress Cry-For-Help, which in turn lessens many other things. Sometimes your hero has to fight EVIL. CA: To bring it back to Bionic Woman, how does all of that apply to her? There's not really much else to tie into at the moment, so do you have the freedom to build your version of Jaime Sommers? PT: I've had a fairly large amount of leeway. Her character has been largely up to me, and I'm going to continue to push bounds. I really want her to be a real person... establish her as an individual that lives in a world. I'm too often reading action scenes in comics these days and coming to a realization that I don't really care who wins a fight. I want to care about characters, so I'm doing my best to develop an ongoing storyline where Jaime shows what makes her tick, her foibles, the parts of herself she wishes she could change, the person she wants to be, etc. And I'm slowly surrounding her with real characters. A woman named Nora, in particular. She'll become very important in the 2nd storyline. CA: Does she have the same bionic parts that she did back in the original show? PT: She has everything that she had before. As to if she has anything MORE, I'd say that she has a few more tricks in her sleeves that will be revealed over time. I'm making very sure to keep her in proportion, though. A friend and I were recently talking about the power progression in the Invisible Woman... how Sue went from "I can turn mostly invisible and hide!" into "I will protect the entirety of New York from nuclear missiles by use of my force field." 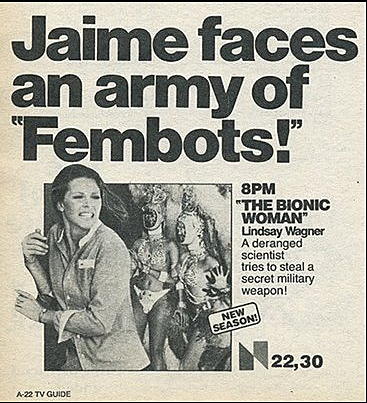 I think Sue lost some of her humanity, there, and since one thing that keeps Jaime Sommers up at night is the question of her own humanity, I want to make sure that she remains Jaime Sommers... the Bionic Woman, and NOT Jaime Sommers... the Ultimate Devastator. CA: Are you sure? Because I would definitely read Twirling Macho-Cat vs. Ultimate Devastator. PT: I know! But you and I have long since come to the conclusion that, if left mentally unchecked, we would both write comics that would appeal to about twenty-five people. I jokingly mentioned a plot line on twitter today, a storyline where Nancy Drew hires Godzilla to work at her detective agency, and I will state here, without joking, that I would write that comic if I could. My mind literally can't avoid writing that comic. PT: Bionic Woman is straight-up action adventure super spy material. BUT... I do have some creator-owned projects coming up, and I'm unchecked in a couple of them. CA: Can you tell me anything about them yet? I know you mentioned your first novel that's coming out soon. PT: I haven't gotten the okay to release news yet on them, unfortunately, but I have creator-owned material coming from at least three companies in 2012. And, yeah... my Prepare to Die novel comes out on June 5th. That's certainly a rollicking ride. I've been doing a lot of expansion into creator-owned projects, for a variety of reasons. I'll never leave behind the joy of writing lines for Spidey or Batman, but creative control is a wonderful thing. CA: All right, one last question: For people who have never heard of Bionic Woman, have no interest in the franchise, what would you tell them to get them to check it out? PT: Simply that Bionic Woman is a book where pure storytelling can take place. Where the characters can be true to themselves because they're not the 105th version, and where the adventure is completely undiluted by wedged-in continuity from nine other titles. It's a straight up joyride with larger than life characters, and isn't that why we all love these stories in the first place? Bionic Woman #1 is out this March from Dynamite, written by Paul Tobin with art by Leno Carvalho and covers by Paul Renaud.